The co-founder of Lifeforte International Schools (LIS), Sarah Olubi-Johnson, gave a seminar presentation at IITA on 1 December to mentor and motivate the youth towards establishing successful enterprises in Nigeria. Dr Sarah Olubi-Johnson addressing the youth during the seminar. The seminar, themed “Building a successful business in Nigeria’s challenging environment,” incorporated her book titled “Dare to dream and succeed in a harsh economic climate” stimulated among the IITA Youth Agripreneurs (IYA) and IITA Corps members an interest and passion for agriculture and encouraged them to apply some of the principles that have guided her in life. 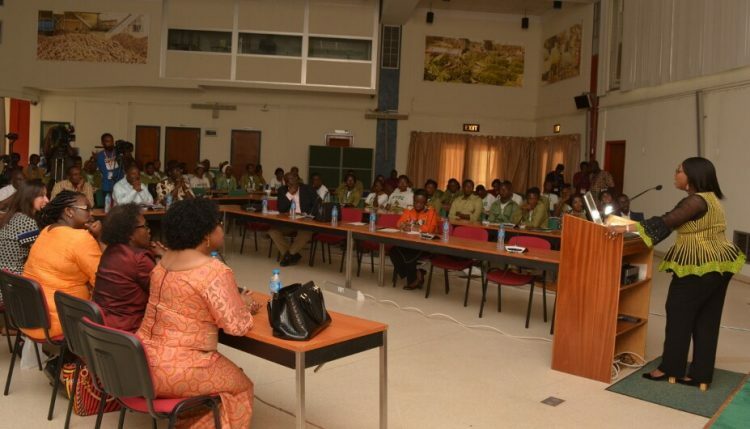 The meeting, which aimed at igniting interest in business opportunities among the youth, was attended by IITA staff, IYA, IITA Corps members, representatives from the IITA Women’s group, and a team from LIS. In her lecture, Olubi-Johnson emphasized that reformatting the mind is an important element in attaining greater heights in life. “We must start with a desire and decision to change the old standard, but to do that, we need a new standard which is having the right business ethics devoid of deception,” she added. The meeting ended with a gift presentation by IYA to Olubi-Johnson to express their immeasurable gratitude for her coaching in ensuring they succeed in life.